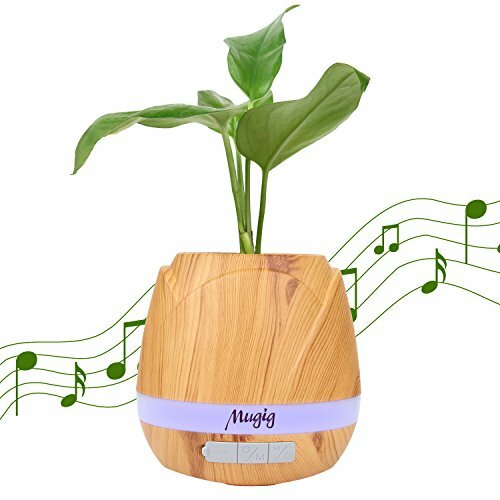 Smart Bluetooth Music Flower Pot:Flower pot that can play music, suitable for a variety of usages. Stereo Bluetooth speakers: Connect the bluetooth device and becomes a stylish Speaker for play songs. Magic Piano: New sensor technology allows plants to interact with you by Every touch. Home essential: Colorful lighting function and plant cultivation, greening and enjoy the fun of music at the same time. Long battery life & power saving: 4 hours fully charge and 12 hours music play. It's a flower pot, a Bluetooth speaker with HD sound, a color changing night light, & a fun piano instrument, makes for a unique & thoughtful gift. May just be the most awesome gift ever. Must give a 5 star. Sound and volumn level are great. Has built in songs, lights and all in a flower pot. I really love it and makes a great present for anyone. I Love This Flower Pot! Makes me want to have a plant! This is the coolest little gadget! It plays music, has lights and it's a flower pot. It comes with USB cable and instructions. Love it!